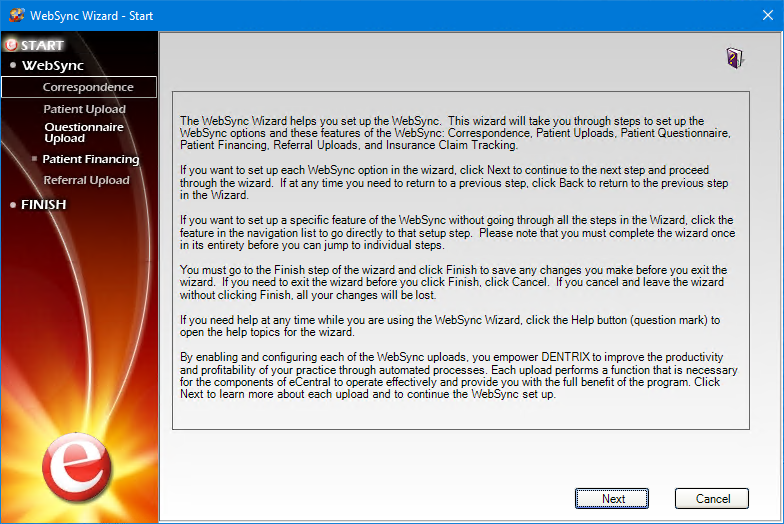 Before you can log in to Dentrix Mobile, you must set up Dentrix Mobile using the WebSync Wizard. 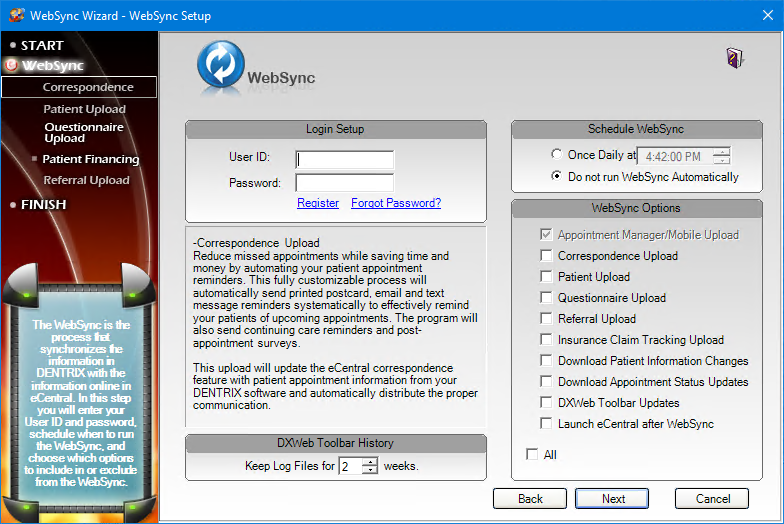 A WebSync is performed to synchronize data between your practice management system and other programs like eCentral and Dentrix Mobile. 1. In the toolbar of any Dentrix module (such as Family File), click the DXWeb Toolbar icon . If you have set up the WebSync Wizard previously, the DXWeb Toolbar appears. a. Click the Settings icon on the toolbar, click DXWeb Updates, and follow the prompts to install the DXWeb Updates. b. When finished, click the Settings icon on the toolbar again, and click WebSync Wizard to launch the WebSync Wizard. The WebSync Wizard – Start screen appears. This screen explains some basic information about running the WebSync Wizard and performing a WebSync. The WebSync Wizard – WebSync Setup screen appears. Tip: At any time throughout the wizard you can click Back to return to the previous screen or Cancel to exit the wizard without saving any changes. a. Under Login Setup, enter your eCentral User ID and Password. The User ID is the same as your username for eCentral. If you don’t have an eCentral user ID, click the Register link. · Once Daily – If you select this option and enter a time to automatically perform the WebSync, the WebSync will run every day at the time you specify. We recommend that you select a time when your office is least busy because the WebSync could potentially slow down regular work. · Do not run WebSync Automatically – Select this option if you want to specify each time a WebSync is performed. With this option you will need to remember to run a WebSync each night before you leave for the day so that the data is available on Dentrix Mobile or eCentral. 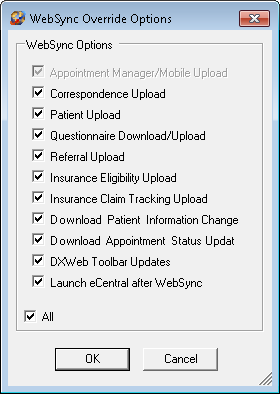 c. Under WebSync Options, notice that Appointment Manager/Mobile Upload is automatically selected; this sends the necessary information to use Dentrix Mobile and the eCentral Appointment Manager. · If this is the first time you’re running the WebSync Wizard, Appointment Manager/Mobile Upload may not appear yet. You may need to run the WebSync Wizard once with the DXWeb Toolbar Updates option selected to add this new option and then perform a manual WebSync. · Appointment Manager/Mobile Upload is not a user-definable option; this is always performed automatically with a WebSync. Important: If you want to use Dentrix Mobile to view information for all of your patients, including those who do not have an appointment, you must select the Patient Upload option. 3. 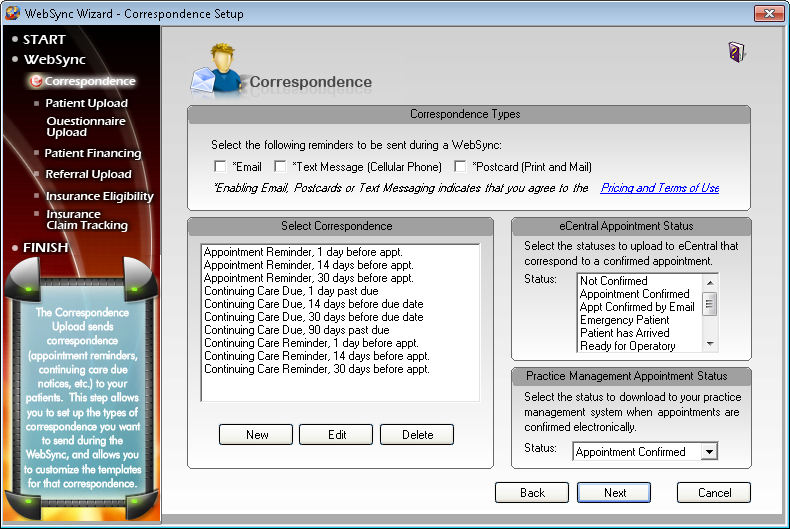 Click Next until you get to the WebSync Wizard – Correspondence Setup screen. If you don’t send Email, Text Message, or Postcard reminders through eCentral, you will want to clear these options under Correspondence Types. 4. Click Next to accept the defaults for the next screens in the WebSync Wizard until you get to the WebSync Wizard – Finish screen. 5. Click Finish to save any changes you have made. If you chose Do not run WebSync automatically in step 2, or if you have data you want to sync before or after your automatic WebSync has run for the day, you will need to perform a manual WebSync. 1. In the toolbar of any Dentrix module, click the DXWeb Toolbar icon . 2. Click the WebSync button, and then click WebSync override. The WebSync Override Options dialog box appears. The WebSync Override Options default to what you selected under WebSync Options in the WebSync Wizard. You can select or clear any option here without affecting the default options you specified in the WebSync Wizard. Note: The Appointment Manager/Mobile Upload option at the top of this dialog box is always selected and cannot be turned off. Any time you run the WebSync Wizard or perform a manual override, key appointment and patient data for patients with past or future appointments is automatically synchronized between Dentrix and Dentrix Mobile. You do not need to have any other options in this dialog box selected to update Dentrix Mobile. The WebSync Override begins and runs through each option that you have selected. A blue line indicates an option that was skipped because that option is cleared in the WebSync options or in the WebSync Override options. Once a WebSync has been performed on all your selected options, the WebSync In Progress screen closes, and you are able to log in to Dentrix Mobile or eCentral. Before you can use your mobile device to view patient information and view appointments, you need to log in to Dentrix Mobile. 1. From your mobile device, in the address bar of your Internet browser, type mobile.ident.com. · To open the phone view, use mobile-phone.ident.com or mobile-phone.dentrix.com. · To open the slate view, use mobile-slate.ident.com or mobile-slate.dentrix.com. The Dentrix Mobile login screen appears. 2. 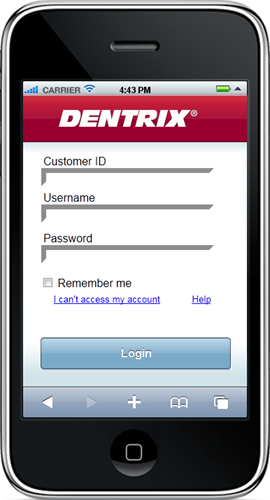 If you’re an eCentral user with an existing account, simply enter your Customer ID, user name, and password to log in to Dentrix Mobile. If you are not currently an eCentral customer, you can obtain a free account to use Dentrix Mobile by filling out the Dentrix Mobile Registration form when you visit www.dentrix.com/mobile. · When you tap the Username or Password fields on an iPhone, a keyboard appears on the display. · Your password is encrypted as you enter it. · If you enter an invalid username and password, Dentrix Mobile displays a “Username or Password is incorrect” message and clears the password field. Tip: If you forgot your password, tap the Forgot password? link, and an e-mail message with your password is sent to you. 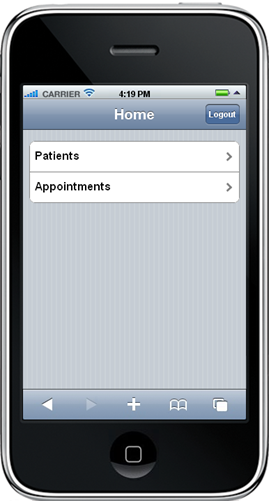 The Home screen appears, where you can view patient information and view appointments.